When searching for something on Yahoo! or Google, you will notice that there are sections on the top or the right-hand side of the page that are of a slightly different color and marked with text like, "Ad related to..." or "Ads". These results are based on the search term used and do not appear on the basis of relevance, but price. The ranking and placement of these ads are bid upon in an auction where the highest bidder generally wins. For this reason, it can be easier to rank higher simply by having a larger wallet than your competitors. A company bids upon a price for the spot and pays every time someone clicks on their ad (hence the name, pay-per-click). 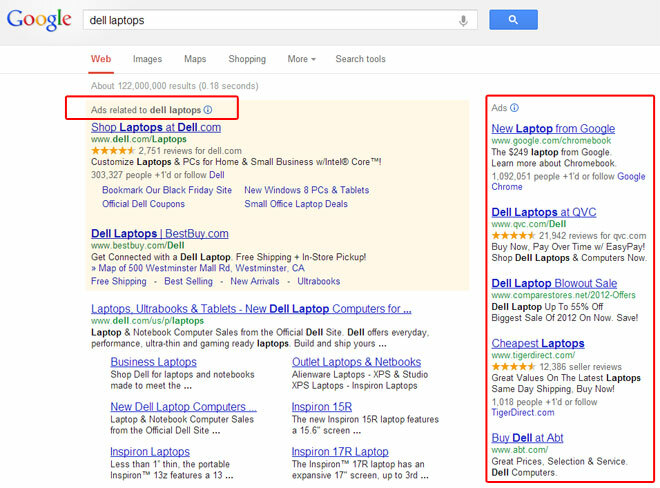 Google calls these, Adwords. Even though you can set limits to how much money to spend on ads, these ads can still get expensive. Also, many people seem to have an aversion or distrust for paid advertising and so very few people actually click these ads. However, there are still those who do click on these ads and turn into business. These ads can also be modified to be targetted toward your audience. In the example screenshot above, Dell has not only provided links to their sales websites but also links for other related material as well. Such is a benefit of paid advertising. On the block of ads to the right, there are ones listed with gold stars. This is a method to add more credibility to a pay-per-click campaign ad. In the screenshot above, Dell's website is listed higher than Best Buy's. In that instance, Dell is paying more per click to maintain that supremecy, but given the nature of the sales business, Dell still profits from sales made by their many retailers. There are many pros and cons to using paid advertising, but a quality pay-per-click or well designed Adwords campaign may still prove useful as another net to catch new business. PPC can be done without the aid of an SEO company, but it would be financially sound to at least invest some time with a pay-per-click professional to set up your advertising campaign.